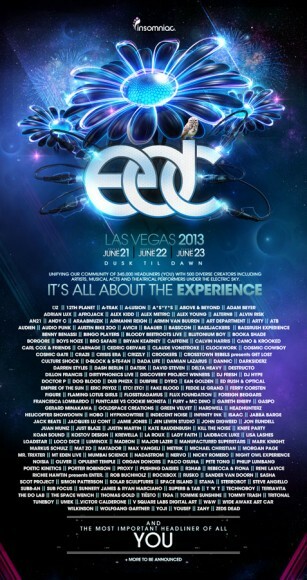 The 17th Annual Electric Daisy Carnival in Las Vegas will be returning to the Las Vegas Motor Speedway on June 21-23, 2013, and is sold out. They had just announced their lineup for EDC New York for May 17 and 18, 2013 at Citi Field in Flushing, New York, and with editions in Chicago, Puerto Rico and Orlando to be announced shortly. They announced their lineup of performers, which their diverse list includes musical acts, artists and theatrical performers from around the world for EDC Las Vegas. They will be worked into the event, including fire twirlers, aerialists, dancers and stilt walkers as part of the show. There will also be vibrant large-scale art installations and state-of-the-art lighting and sound productions spanning across seven stages. The event is sold out, but shuttle passes and hotel deals are available via www.electricdaisycarnival.com.